Wipe the dust off those fall jackets – a push of cooler air in the region will make this weekend finally feel a little more like late September. 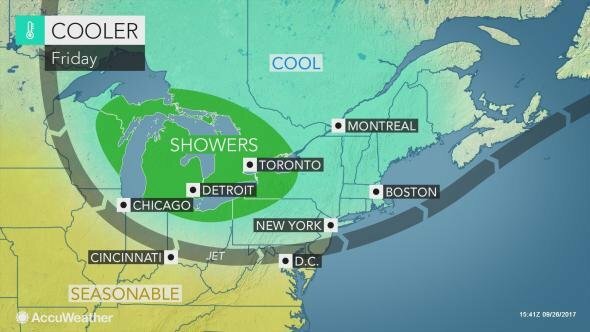 A "major change in the weather pattern" will mean highs in the upper 60s and lower 70s over the next few days, after the Philadelphia region saw hotter temperatures in the 80s this past week. The push of cooler air will most drastically impact the upper parts of Pennsylvania, with some areas expecting frost, though it looks like the Philly region has made the cutoff between where it will feel downright cold and where it's just "seasonable," according to AccuWeather forecasts. While the days will remain comfortable, lows in the 50s this weekend may mean it's time to bring out the heavy-duty comforters – at least for the weekend. Forecasts show a warmup for the first week of October, with temperatures that may climb back up to the 80s. "Spanning the rest of the week, from west to east across the North Central and Northeast states, temperatures will be slashed by 15-30 degrees Fahrenheit from their peak this week," AccuWeather reported. Below is the weekend forecast for Philadelphia, South Jersey and the Poconos from the National Weather Service. Thursday: Expect sunshine with a slight breeze of 20 mph with a high near 80 before temperatures dip to just 53 degrees. Friday: Sunny and much cooler with a high of 71 degrees. There's a slight chance of showers after 2 a.m., with a low of 54 degrees. Saturday: The chance of rain continues until 8 a.m. before it clears up for sunshine and a high of just 68 degrees. The mercury is expected to drop to 50 degrees at night. Sunday: Sunny with a high lingering around 70 degrees and a low near 52 degrees. Thursday: Sunny with a high near 80 degrees before dropping to 49 at night. Friday: More sunshine before the start of the weekend, with temperatures expected to hit 70 degrees, with 50 degrees as the low. Slight chance of showers after 2 a.m.
Saturday: Chance of showers before 8 a.m. A high of 67 degrees is expected later in the afternoon. The low will be 47 degrees. Sunday: Sunshine with a high around 69 degrees and low around 48. Thursday: Sunny with a high expected near 72 degrees. Gusty, with winds close to 30 mph. The low should reach a chilly 45 degrees. Friday: Sunny with a high around 67 degrees and a low of 45. Saturday: Chance of showers before 2 p.m., with a high around 62 degrees. The low could drop to 41 degrees. Sunday: Sunshine with a high nearing 67 degrees and a low of 42 degrees.